RAT ALLEY is infamous among the legions of the plumber. Rumor has it that extremely large rodents live in the maze of tunnels that make up the area. The last plumber that ventured into RAT ALLEY disappeared without a trace. (The only clues they found as to his demise were a hard hat bent to look like Mickey Mouse ears, and a pipe wrench with a bite out of it.) You are Larry Bain, ace Plumber, of Rodent Rooter plumbing service. Your job is to install pipe through the many levels of RAT ALLY. MOUSKATTACK is an unbeatable blend of quick thinking arcade action for one or two players. Pick up and move traps and cats but beware, some of these rats are so monstrously large that, rather than running away from cats, they'll have them for lunch instead! Also traps can only hold these rats temporarily unless you rush over and smack them in the head. In addition the supply of cats and traps is limited. And to make things even more complicated, while installing pipes, Larry Bain occasionally misses a section, requiring him to retrace steps to ensure all pipes are properly connected. Mouskattack can be played by one or two people and can be played with keyboard and/or joystick. First released in late 1981 for the Atari 8 Bit and developed by John Harris, Mouskattack's game play resembles that of Pac-Man. In fact the code of the game was based on On-Line Systems' Pac-Man clone Jawbreaker, which in itself was a slight modification of On-Line Systems' earlier Gobbler, for which they were sued as it resembled Pac-Man too much. Jawbreaker was also developed by John Harris. 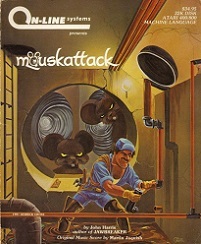 In early 1982 Mouskattack was remade for the Apple II by Ken Williams and Al Nystrom. 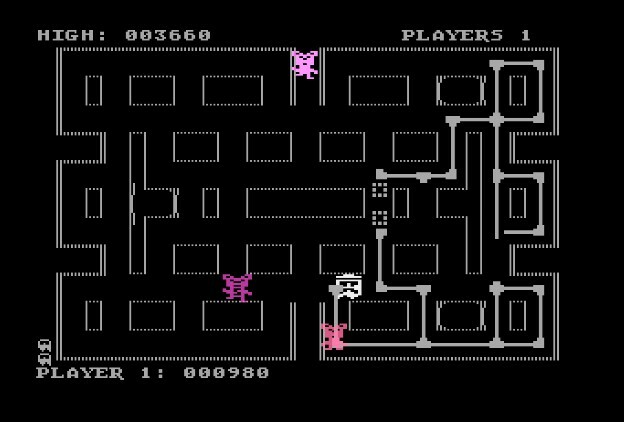 The difference between the Atari release and Apple II release is immense, including a different maze and slightly different game play. Finally the Atari release was also ported for the IBM. - Larry Bain - the protagonist of the game - was a real person who worked at Sierra. Shortly after this game was launched he disappeared and was never seen again. - John Harris was John Williams' roommate when he wrote this game. It wasn't a great seller, but John thinks he whipped it out in less than two weeks.